According to Greek mythology, Lindos was founded by Danaos, son of the King of Egypt (the country), who resorted to Rhodes together with his 50 (!) daughters, afraid of his brother (who was actually called Egypt) and his 50 sons (! ), whom their father had actually apppointed as the new ruler of Egypt (the country). Confused yet? Anyhow, Danaos and his daughters built a temple in honor of Athena who helped them escape, and then continued their trip to reach mainland Greece and Argos, where Danaos ruled for a long time. Traces of life in the area date back to the neolithic area, but the first reference to the town and its inhabitants can be found in the Homeric texts, according to which Lindos took part in the Trojan war. The worship of Athena of Lindos has been documented since the Geometric Years (9th century B.C. ), but the town reached its prime during the 6th century under the rule of Kleovoulos, one of the Seven Wise Men of the ancient world, who brought about many ground breaking reforms. During his rule, the ancient temple of Lindia Athena was rebuilt with every glory and was established as one of the most respectable places of worship in the ancient world. The temple retained its fame all through the roman and hellenistic ages, allowing Lindos to continue to grow and accumulate wealth. Its location (perched on a steep hill) and clever architecture attributed the town a fortress-like presence and the Acropolis was historically used as a refuge during times of crisis. Built 116 meters above see level, the Acropolis of Lindos is an impressive balcony to the Aegean sea with some of the most interesting archeological findings from many different historic periods all in one place. The walls were built by the Knights during the middle ages, the famous temple of Lindia Athena was built by Kleovoulos back in the 6th century B.C., there are statues and shrines dating earlier than that, and even findings from prehistoric times. 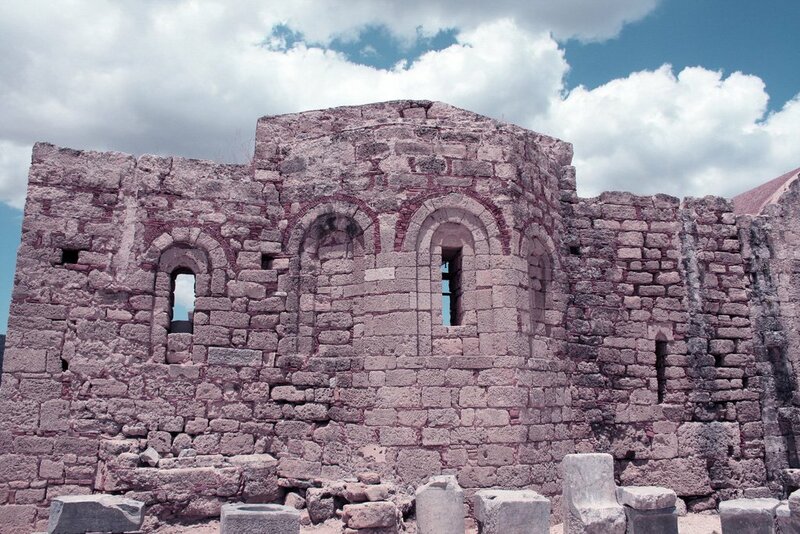 Then, there are the glorious remnants of hellenistic times, like the 42 column arcade, as well as more recent constructions echoing the coming of Christianity, like the impressive 13th century A.D. church of Saint John. Everywhere you look, while visiting the ancient site of Lindos, there is something to marvel at, starting from the very foot of the Acropolis' hill, where a huge replica of a Rhodian trireme vessel is carved in the rock to commemorate Lindos' nautical strength. It is said that the first shipping laws where actually drawn up in this very town, in the form of an ancient maritime codec respected by all since the 2nd century B.C. 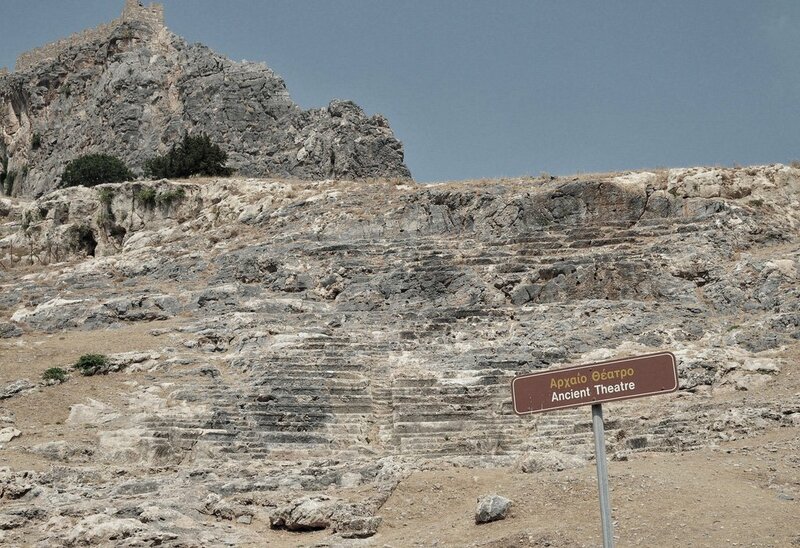 Another impressive site is Lindos' ancient theatre, with its orchestra (central stage) and viewer stands carved in the rock and a capacity of 1.800 spectators, and of course the focal point is the famous temple of Lindia Athena, part of which still stands intact by the passing of time. At the north east side of the Acropolis, the location called Vigli, visitors can wander through a place of sacrifice with 38 inscriptions and a small temple for the keepsake of oblations for a deity that still remains unknown. There are also two very interesting sites to see outside and around the Acropolis, where the ancients used to burry their dead. “Kleovoulos' grave” is not the grave of the actual ruler of Lindos, but the burrying site of a very wealthy family, which has a rather interesting morphology: it is a graceful round construction with a vaulted ceiling, which houses an impressive sarcophagus carved in the stone. Another important graving site is the “Archokratio”, which is also carved in the rock of the hill. Its facade mimics the entrance of a two-storey building and inside it houses 19 tombs and a ceremony hall. On the ruins of the ancient town, stands the contemporary town of Lindos, a preserved traditional settlement which boasts its own points of interest and attracts as many visitors as its neighbouring ancient Acropolis. When you reach Lindos, situated between the cape of Krana and the ancient site, you need to leave your car behind and enter on foot, as is the norm in many traditional villages in other islands, i.e. the Cyclades. Truth be told, Lindos is a settlement strongly reminiscent of Cycladic scenery, with its own cobblestoned winding streets and white houses with colorful doors, traditional taverns, coffee shops and a square under the shade of a huge tree with a fountain in the middle. But a closer look will soon reveal the amazing cultural crossroads that has been Lindos through time: a mixture of medieval, byzantine, arabic and traditional Greek architectural elements are evident in the settlement's buildings, most prominent of which are the so- called 'captain houses'. With their tall stone fences, vaulted entrances with carved coat of arms and wooden doors, engraved details, cobblestoned yards and elaborately painted ceilings, they are excellent specimens of the talent and skill of the local craftsmen and of the elevated lifestyle of Lindos' inhabitants from the 16th until the 18th century A.D.